Eight foot (or 8'4") floor-to-floor height does not create "8 foot high ceilings". Previously in this thread (I can't find it now, but I think it involved KelvinZero, lamontagne, and myself), we discussed cellular structures, but with a focus on them being modular, expandable. Do you think you can change your structure such that the cells can be added, changed, after an initial structure is built? I think your illustration shows it very well, but actually illustrates the opposite conclusion. If you build a conventional building inside a circular thin walled pressure vessel it will always be less expensive than a building built from a number of reinforced pressure vessel walls. Because the interior building is a simple conventional gravity structure, while the reinforced fabric building is a tension structure, requiring much higher quality materials and al large number of complicated joints and fittings. I believe the argument is to move some of the required external structural mass inside the overall building, and then use that to also live on/in/through. In other words, the mass of the interior structure replaces mass that would otherwise be part of the exterior. Same overall mass as an empty single volume. In effect eliminating the entirety of the interior (compressive) building. Ahhh, hoop sections. That makes a lot more sense to me. I thought you were describing a stack of cylinders, ie a hot dog packet. Stacked hoops makes more sense. Stacked square hoops are going to be interesting. 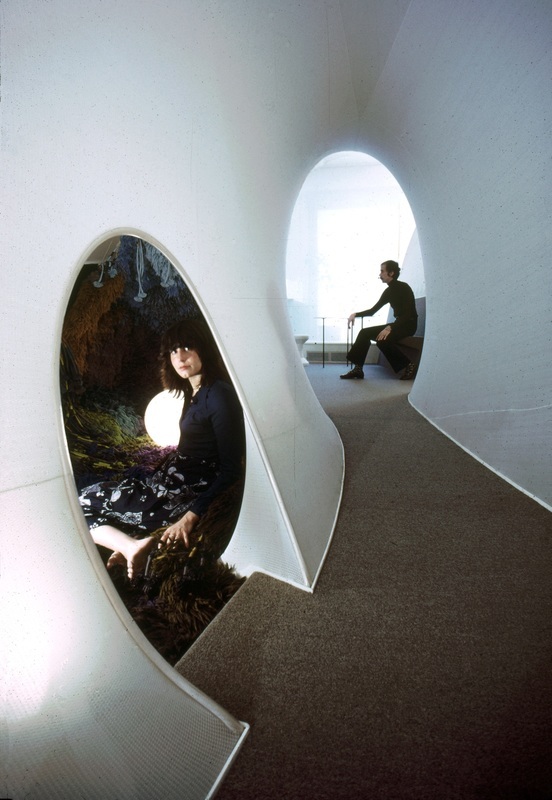 Your proposal is most similar to the hexagonal inflatable station NASA was thinking about in the 60s. Box-shaped pressurised structures are doable but they're a pain. This is one of those Amazon packaging pillows you get. Internal pressure is typically around 0.2 atm. Note that the pinching-in of the long sides is the greatest due to the strain from internal pressure in the centre being the greatest, so what you want will be a cube. Of course, you could deliberately use this to your advantage: make the low-tension corners where you have your weaker transparent material. I assume this is what you're advocating with the angled corners? Adding cells, making it more spherical (ie a cube) gets rid of this tendency to bulge, like those inflatable ottomans. However, in terms of radiation shielding, you have to generate more ISRU mass for the same quantity of shielding. Domes are the optimal shape for a shielded volume, also in part because they are self-supporting and easy enough to build. You will need at least 2 metres of material to achieve anything like an acceptable radiation reduction. And the more mass you have inside your habitat, pot plants, furniture etc the more shielding you get on top of that. So there is a bonus to having traditional concrete/brick internal structures. Regarding using fabric for flooring... I don't think it's worth the mass savings. For reasons Paul451 mentioned, but also because fabric stretches and wears over time. Human footsteps in Mars gravity actually generate 2/3 of the forces they do on Earth (on the Moon, just under 1/2), so the loads are not that reduced. And if a tensioned fabric starts ripping, it can keep on ripping, dumping the room's contents into the room below. There are a lot more reasons I don't think it's a fantastic idea in the context of a permanent habitat, those were the two main ones. Bear in mind, I don't deal with tensile fabric structures at all in my day job (just accounting for stretch and slippage in steel cable), I just know from what I've picked up that inflatables and fabrics are kind of a specialised art, and do come with their own issues which must be managed. I don't think rigid material for internals will be a problem. NASA already has a machine that chomps the crew's garbage and turns it into plastic. The bonus of thick floors is that they double as shielding for the people below you. And there is plenty of regolith to sinter or glass or otherwise turn into bricks with very little production effort. However, using fabric partitions for early settlements would be a good idea. Rounded interiors give an impression of greater space, so you could use tensile fabric structures to make a very stylish and zen interior. You could also have simple fabric wall partitions on an aluminium frame. Tensile fabric would also be a good debris protection from Starship landings, fairly easy to stretch over delicate modules into a kind of ballistic tent. 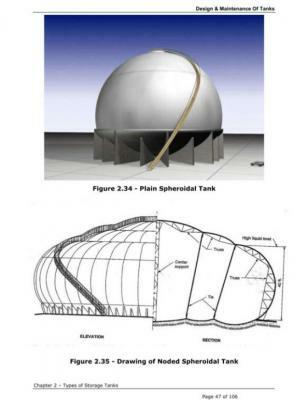 As for multi-cell designs, are you familiar with noded spheroid tank geometries (below)? They're used for partially-pressurised tanks, although they've fallen out of favour due to difficulty inspecting the nodes between the toroid sections. As for cellular structures, the Beijing Water Park is basically an empty box with fancy walls. Interconnected cells without a rigid framework would strain unevenly with the centre roof and floor of the box getting the most strain, and the outer cell corners more relaxed. 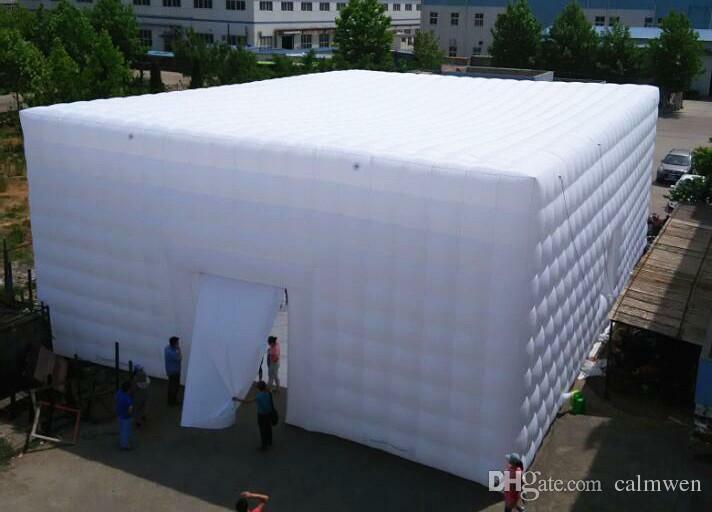 For the inflata-cube design, simply having cubic subdivisions on the inside makes the most sense. Other primitives don't lend themselves well to human-occupied rooms, no matter what architects would have us believe . The strapping of the exterior surface would have to be given some careful thought... the straps clustering around the centre since that's where there is the most strain. Probably have aluminium truss edges. Something like this, but each cube face is like 3m on a side. Internal tension control would come from steel cables because of their tendency to not elastically stretch or degrade. The exterior mass required for insulation and protection from the Martian environment (abrasion, UV etc) would be approximately 1.4x that of a sphere of identical volume (sqrt 6: sqrt pi). Actually, a shade more than that since the cube faces are pillowing. Going back to radiation shielding materials, OLTARIS tells me that a 2m thick dome (well, sphere) on Mars reduces the radiation dosage inside to about 1/4 of the unshielded surface dose. So that's 20g/cm^2 of CO2, 200g/cm^2 of H2O and the surface blocking half the incident GCR is 300cm of regolith (this is modeled for backscatter). Next I'll try with 200g/cm^2 of Martian regolith and then try a mix of 100g/cm^2 ice then 100g/cm^2 regolith to see what that does. Regarding "very tight quarters," I chose a height of 2.5 meters (8' 2.4") specifically because standing in a room with an 8 foot high ceiling felt more than comfortable/spacious, although I'm 5' 11" (180 cm) and the human figures are somewhat arbitrarily 6' 4" (193 cm), ie the NASA height limit for mission specialists. I'd be cautious estimating occupant claustrophobia by viewing it as a dollhouse on a screen. There's simply no substitute for standing in a space and feeling it, which is what makes VR so compelling. Don't forget that the gravity on Mars is only 0.38 g. Walking will be a slow and cautious affair if you don't want to hit the ceiling. Also some major health problems in micro (or reduced) gravity are caused by not enough muscle and bone loads, which means that you actually want to encourage people to jump, climb, run and generally strain their bones and muscles during normal day to day activities. Having more vertically oriented habitats forcing the inhabitants to put effort into moving around could be quite imperative if you don't want to force them to strap themselves for two hours a day onto exercise machines. This is a sharp contrast to weightlessness, where you have no choice. But if you have a third of a g, you can work with this. Orientation doesn't matter in zero g, in full gravity horizontal orientation is more convenient, but in reduced gravity vertical orientation might be just better. Sorry for the long post, but I want to clear up any misconceptions. By "height" I meant floor to ceiling height. Again my understanding is that it's driven by the minimum profile thickness of the floor truss, not the pressing need for utility space. Sure, if you're stuck with all this otherwise-useless truss space it makes sense to put utilities there. But my supposition (partly based on observing the low volumetric density and poor packaging efficiency of utilities in such false ceiling spaces) is that clever packaging can redistribute these utilities in a less volumetrically wasteful way, in part by utilizing otherwise awkward or dead spaces. I assume that both the high cost of pressurized volume and duct mass will drive toward high velocity ducts, which reduce duct volume by 75% at the expense of blower power. There's of course some "best" (cost-optimizing) duct speed that balances these two factors, but with pressurized volume at such a premium I think the design trades will settle on a higher duct speed/pressure than found in commercial buildings on Earth (which, naturally, have no incentive to conserve their "free" truss space). Note also that the outer wall/attic/basement hoop space provides a convenient volume for running specialized oversized utilities the length of the hab (I suppose one limitation is that "only" 14 out of 20 compartments are adjacent to a hoop space). If not used as a redundant double-layer wall, the entire hoop volume could conceivably be used as large supply and/or return ducts. Not sure if this makes sense, but it's an option. Regarding using fabric for flooring... I don't think it's worth the mass savings. For reasons Paul451 mentioned, but also because fabric stretches and wears over time. Human footsteps in Mars gravity actually generate 2/3 of the forces they do on Earth (on the Moon, just under 1/2), so the loads are not that reduced. But is it worth the mass/material savings + pressurized volume savings + Martian assembly labor savings? Unfolding a hab, anchoring it, and inflating it is much easier than bolting together a rigid structure from pre-fab parts (especially wearing a pressure suit). Walking on a fabric pressure vessel under tension? Yikes! But I think it can be made ok if covered with a suitable load-spreading foam "carpet underlayment" and an appropriate thin hard-wearing traction floor — picture a souped-up vinyl carpet protector, though perhaps not actual vinyl. Or instead of foam, perhaps alternating-direction layers of coroplast (or per the low-tech survival thread, cardboard) to spread out point loads. Whatever the floor protection layer[​s] ends up looking like, it's almost certainly lighter/cheaper/less work than building a complete standalone structural floor and supporting wall/column structures (which is effectively what is replaced). Beyond just raising the problem again, is something unworkable about my solution? Because it seems to at least plausibly address the issue (I'm not suggesting it is solved of course, just that it appears solvable within a reasonable mass and R&D budget). And if a tensioned fabric starts ripping, it can keep on ripping, dumping the room's contents into the room below. Practically all structures can be subject to cascading failure, and the solution is the same: redundancy, structural margins, and inspection and maintenance. I have proposed loops threaded into multi-way buckles (or more technically, clews) that open to free/capture the loop. During replacement the wall would first be detensioned by installing special temporary perimeter beams. These attach to each clew and have cables spanning between them, and this assembly assumes the tension during replacement. No heavy equipment needed. The simplest clew is just four rods (for the straps to loop around) all bolted together by two rounded squares on each end, with a hole in the square where the pins for the temporary support beam engage. I'll have to draw a picture. Not different at all! In fact I mentioned that configuration as one possibility, and I think it's a good one. Nothing's set in stone yet, but I worry the diagram mistakenly gives people that impression. I drew it mostly to illustrate my geometric/engineering argument in favor of cellular hab designs. Don't mistake it for The Final Design (or even the current design-in-progress). Thanks, I didn't know about that! Note that the pinching-in of the long sides is the greatest due to the strain from internal pressure in the centre being the greatest, so what you want will be a cube. Squares do minimize strain anisotropy, but they also add assembly complexity. I think you just terminate the hoops in a pillow shape like this (which is fine, because as you point out it experiences less stress than a cylinder). My goal is "nothing left to take away." Why perform assembly in two directions when you could just double the thickness of the straps in the hoop direction and eliminate half the seams? Also, wouldn't a quilted hexagon grid be closer to the ideal spherical section? I'm not suggesting hexagonal rooms (which have obvious problems), but a hexagonal grid of vertical posts. This appears almost identical to a square grid except each row is staggered. Of course, you could deliberately use this to your advantage: make the low-tension corners where you have your weaker transparent material. I assume this is what you're advocating with the angled corners? Close, but that's not quite it. I want to respond to everyone's questions and comments first. It's perfectly fine to put the weak transparent material across the entire area, since it only spans the empty square between the tensile straps (this is where the "cube pillows" come in, and here it is optimal). For regular opaque walls this span is 1-2" or 2-4 cm, but for 'transparent' walls it might be as much as 4" or 10 cm to maximize transmissivity. In the limit these are long cylindrical sections, so the hoop stress is twice the axial stress. The hoop straps are twice as thick accordingly, causing a 50% mass penalty for the tensile restraint. This isn't as bad as it sounds since it only scales with the volume enclosed by the hoop, not the total building volume, and also the pressure restraint layer is only a fraction of the total hoop assembly's mass. BUT this buys you a 50% decrease in seam length (improving reliability), making inspection easier by replacing many four-way seams in isolated "rooms" with fewer long two-way seams in "hallways". It also makes the layout more flexible (since tensile interior walls are only needed in a single direction), and minimizes the number of rigid door frames needed to allow circulation through restraining walls. Counterexample time. Let's say your domes get very popular and you start tiling these X meter tall domes across a flat Martian plain, using hex tiling for the tightest possible packing. You say this is optimal. And yet I can improve on this configuration! If I take the same quantity of regolith per hectare and arrange it into a flat slab X meters off the ground covering a large hab, I've simultaneously A) made the rad shield 81% thicker because it no longer has to follow the hump of the hemisphere "up and down," and B) increased the amount of shielded volume by 65% because the cellular hab takes up the full height everywhere. If domes really were the optimal shape, how could such improvements be possible? I think you may have inadvertently asked/answered the wrong geometric optimization problem. also in part because they are self-supporting and easy enough to build. I can do it easier: simply pile cheap loose regolith on top with a crane, rather than needing to compress/sinter/sulfurcrete/icecrete/whatever that same regolith into rigid blocks and then laboriously (robot or human) assemble them into a self-supporting dome. The hab can still be self-supported if unpressurized, since that's a separate design decision. But there's no need to spend anything "improving" large amounts of regolith for a simple rad shield. Just scrape it up, or blast some from the local gravel pit, or reuse convenient mining/tunneling waste. Whichever's cheapest on a particular site. the more mass you have inside your habitat, pot plants, furniture etc the more shielding you get on top of that. So there is a bonus to having traditional concrete/brick internal structures. The bonus of thick floors is that they double as shielding for the people below you. And there is plenty of regolith to sinter or glass or otherwise turn into bricks with very little production effort. There is a bonus, but it's not worth it. This design still has pot plants and furniture of course. The only mass I've deleted is the unneeded gravity structure, and compared to that, loose regolith will be vastly cheaper per-kg (and each kg so invested will shield the entire hab, not just the lower floors). Don't spend a dollar on steel to save a penny on dirt. I don't think rigid material for internals will be a problem. NASA already has a machine that chomps the crew's garbage and turns it into plastic. Ok, you have a supply of bulk raw plastic. Problem is that rearranging that plastic into a highly reliable hab is the hard/expensive part, not getting the plastic. That's partly why my idea is to build and pre-test the habs on Earth first, and only later build them on Mars when the technology matures. Yes, that's a great example of the structures I'm describing! This particular layout also has the "big open void" problem though. ...The strapping of the exterior surface would have to be given some careful thought... the straps clustering around the centre since that's where there is the most strain. Probably have aluminium truss edges. Those are true of the Beijing Water Park (which is essentially a gravity structure with a long span, mostly holding up its own dead load), but not of cellular pressure vessels. The "span" is only as wide as the cells themselves, the strain should be theoretically uniform throughout the volume, and the pressure forces will completely overwhelm the dead load even with regolith on top. Having no subdivisions (just a grid of vertical posts/cables) would be even better than cubes imo. But again, why choose square subdivisions over simpler long rectangles? The small reduction in peripheral restraint mass doesn't seem to justify all the additional joints and assembly complexity. Note that roof/floor trusses are conventionally laid out in long parallel rows, not in an "elegant" square grid. The exterior mass required for insulation and protection from the Martian environment (abrasion, UV etc) would be approximately 1.4x that of a sphere of identical volume (sqrt 6: sqrt pi). Again, I think you have to compare a tessellated grid of spheres to a large, flat cellular building (one such that total outer wall area << total outer roof/basement area). This counterexample shows that in the limit cellular buildings only require 0.60x as much mass for insulation and protection as the sphere, not 1.4x. Far from a 40% mass penalty, cellular habs enjoy a 40% mass savings! Actually, a shade more than that since the cube faces are pillowing. Likely true for the top and bottom, but I've been assuming the wall's thermal and protective layers can "shortcut" in area-minimizing straight lines (similar to how MLI is installed on satellites or the LEM). I was going to mention this all when I covered thermal, but now seems as good a time as any. There's a rather unconventional solution: install the roof thermal insulation above the piled regolith shield. Now you have a huge thermal buffer that equilibriates at room temperature. Switchable insulation (essentially heated nickel hydride in an evacuated MLI blanket, needed since regular MLI works poorly in the Mars atmosphere; see also Quest Thermal's ME-MLI) could soak up daytime solar heat while insulating against cold night temperatures. Or vice-versa if thermal rejection is needed. It also means solar heat can be used to pre-warm this large thermal mass up to room temperature after installation. Of course this does mean the insulation needs extra height to cover the regolith shield, but that penalty scales with building perimeter whereas the gain from shortcutting flat vs following the hoops scales with area. So again we find that scaling the building larger makes it get better. How does the 2m thick sphere compare with my 3.62m thick infinite horizontal slab? 2m infinite slab? In general what thickness of slab provides equivalent shielding to a 2m sphere? My geometric intuition says it's <3.62m, which would imply that large flat slabs, not hemispheres, are the optimal shape for city-size radiation shields. Don't forget that the gravity on Mars is only 0.38 g. Walking will be a slow and cautious affair if you don't want to hit the ceiling. This study found no statistically significant difference in vertical head oscillation between 0.3g and 1g when walking at either 4 km/hr or 11.5 km/hr. Honestly whether the floor-to-ceiling height should be 2.5 meters or 2.7 meters or 2.9 meters isn't a very interesting question to me. It's bikeshedding. I'll use 2.5 meters, and folks can use VR goggles to simulate a slightly taller room. Sorry, but there's no real engineering requirement that you be able to play basketball in the hallways. Hence why I prefer multiple levels. That and "amortizing" the rad shield over more volume. Thanks everyone. Really valuable insights! So far (and despite efforts to the contrary) I find no show-stoppers in the cellular concept. Interesting. The settlement is in a crater, up against a crater wall to reduce radiation and separated from the landing pads by several kilometres. 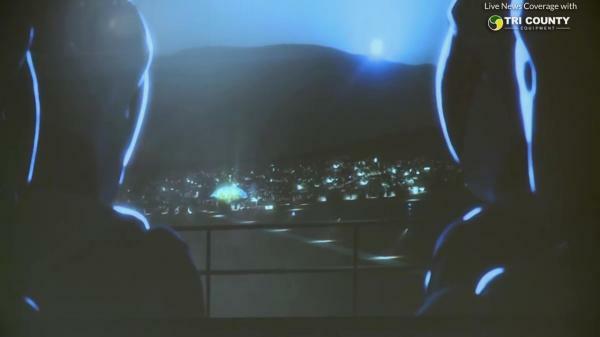 One large geodesic dome for show and the rest are surface buildings of some kind. 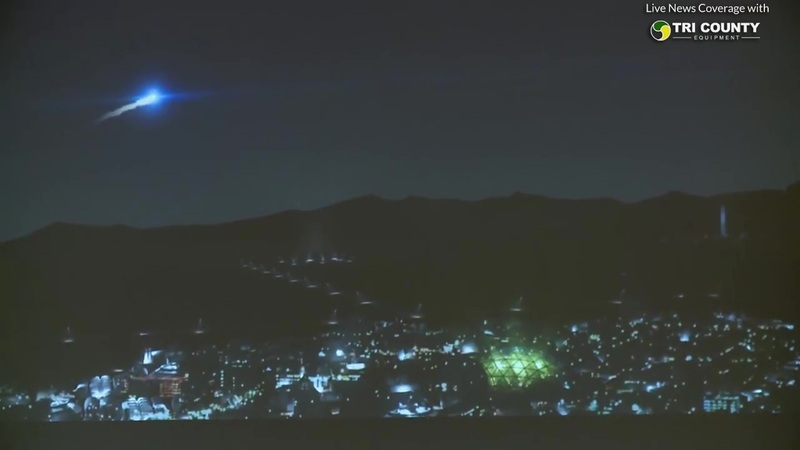 Some of those buildings are clearly repurposed Starships. The majority are very hard to make out but from what I can make out they appear to be solid domes with windows (like Alvernia Studios), varying to egg shapes which I think are good from a radiation shielding point of view. Further away from the geodesic dome are purpose-built buildings similar to what you see on Earth, the models probably purchased off of Turbosquid's sci-fi buildings collection. Solar panels are located in between pad and settlement, out of the crater shadow and using otherwise useless land. It's almost like someone's been reading our posts, but I think this thread and the geodesic domes one has become a pretty good resource thanks to the calibre of discussion and contribution. 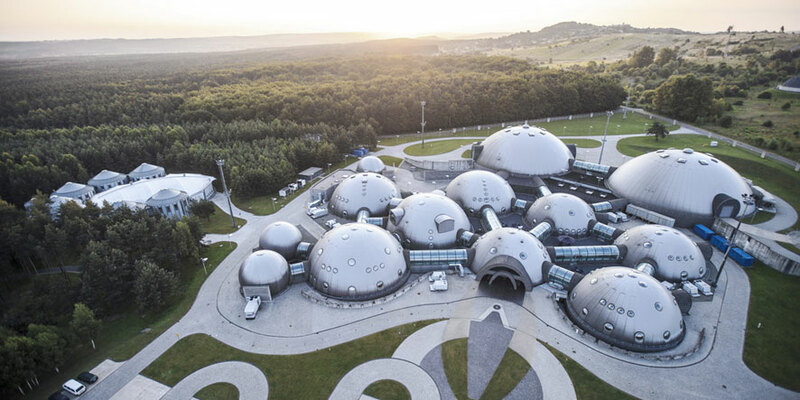 Alvernia Studios in Poland for reference. So as I understand it, the big problem with domes is enough mass above your habitat to passively pressurize it, but enough support structure to keep the structure up if pressure is lost. There is an era of earth architecture that has very similar constraints- Gothic Heavy stone construction for the glory of divinity. A tall martian cathedral, with flying buttresses to help keep the pressure in sideways, (and regular buttresses to keep it from falling in when unpressurized) would be an interesting take on a mars hab. Stain glass mosaic windows can be reinforced with something much stronger than glass in the space between differently colored tiles, while experimenting with the initial poor glass quality we can expect out of local production. And it has presence, which is the reason it developed out of the stone castle-type architecture of the middle ages. How practical do you think a Martian Cathedral would be as a ground hab? IMO, the issue is why you are doing that? Why are you trying to force a compressive structure to act as a tensile container? Just... don't. Use a structure that's meant for the job. I don't understand why that's such a radical concept. Because compressive structures are easy to construct locally, while tensile structures will require imports for longer. Domes are naturally self-supporting: they are arches. That's why so much premodern architecture uses it - and extraterrestrial habitat construction studies. St. Paul's Cathedral is 34m across, the top of the dome is 85m high. Florence Cathedral is 45m in diameter and the top of the dome is 115m high. Passive pressurisation is not required, and generally a bad idea. You would need 15-20m of extremely compacted regolith directly overhead, and as you note would not passively pressurise the sides. There really is no need to do this. 6mm steel as used on the Starship would easily contain 1 bar of pressure in a 30m diameter dome (sphere, spotlight, whatever). The policeman said, "So why are looking for them over here?" The drunk replied, "Because the lighting's better." That reads to me like a 30-40m spire on top of the main arch, and flying buttresses capable of applying similar resistance in compression to the sides. It's as much about the spectacle as it is the practicality. If I recall the whole joke, it hinges around there only being one object to find. There is any number of solutions to the habitation problem. This is just an architectural style. Raw iron is available just lying around on Mars in the form of nickel-iron meteorites. I understand that there are other options, that can be accomplished with less material. That's not the point. Are you wanting a structure that is pretty or one that would be safe enough to raise children in? Ideally, both. Enough engineering margin can cover the safety aspect, but it takes a change in perspective to make an ugly building look good. Note that I'm not saying it's better. That seems to be the entirety of the objections, that there are better options. I'm asking if there are show stoppers to prevent someone from designing a building in this style.